PT Games is very happy to announce that we have become a reseller of Tabletop Football (TTF) by ABC Game company. We have been a player of TTF since 1999 and in fact, made many suggestions (some accepted) from version 7 to 8. We have found TTF to be the best torch bearer of Statis Pro Football. They have brought the game forward to today’s game. 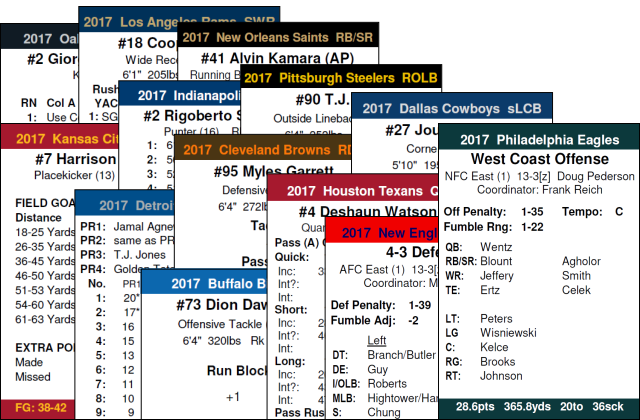 Using advanced stats and methods to generate player and team cards. So many new features we invite you to visit our page TTFto preview the game and if you purchase you will receive a special code ‘ptgames’ that offers a 20% discount. ABC will quickly send along your game and player cards (sold separately).